On a hot summer day, my wife and I stopped by Bite This to refuel. 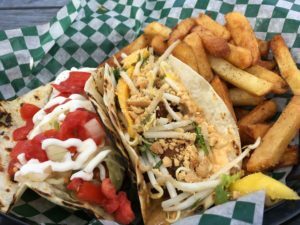 The food-truck-wrapped-in-a-shack-attached-to-a-house is hard to miss when you’re going down Richmond, with its colourful décor standing in stark contrast to the corporate blandness of the Superstore across the street. The menu is awkwardly located inside the shack on a wall, and displays several sandwiches, as well as a few salads, noodle dishes and traditional grill items. A pan-Asian flare runs throughout it, with the likes of curry, banh mi, pad thai, and dan dan noodles on offer. Enticed by their taco special (two tacos and fries for $12.99), we went for the fish and pork meatball options. The Ho Chi Minh banh mi ($8.25) rounded out our meal. My name was soon bellowed after a short wait at one of the picnic tables, and I grabbed our baskets of food. The haddock of the fish taco was in nugget-sized hunks and was wonderfully crispy on the outside, and flaky on the inside. The fresh salsa and lightly citrus-y slaw kept it light and summery – although a quality corn tortilla would have really elevated this taco. The fries were on the thick side, but still had crisp exteriors and fluffy, potato-y interiors. No ketchup needed here, folks. I enjoyed all the flavours packed into the pork meatball taco, including a peanut sauce and peanut crumble, along with a mango and bean sprout slaw. The meatballs themselves had a decent little char to them without being dry. Naming a sandwich after a revolutionary communist leader is a bit of a bold choice, but whatever your thoughts on the man himself, I enjoyed the ‘wich. With much of the same ingredients as the pork taco (peanut sauce, sprouts and cilantro) plus some pickled veggies, and marinated and sliced pork tenderloin, it was a winner. 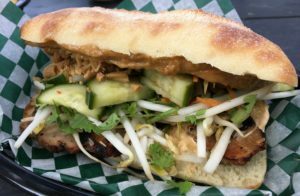 While the hearty ciabatta roll wasn’t traditional banh mi composition, but held up well to the plentiful ingredients. Service was friendly and easy going, with the counter crew chatting amicably with both regulars and first timers. 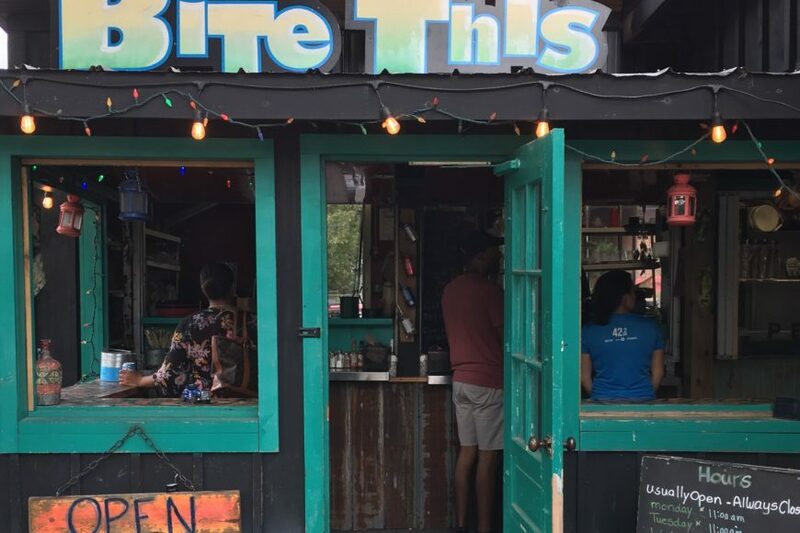 If you’re in the area, Bite This has got your fix for tasty eats in a laid-back atmosphere.